OK, so I've promised myself to prioritise my wedding dress, which means no other projects/distractions before I finish it... and yes, I am going to stick to it! A peplum dress! Of course! What else could it possibly be? After the SS12 runway? This is the Project Runway Simplicity 2282, I just love the versatility of this pattern! The peplum is subtle, which makes it easy to wear on a dress down Friday! After the casual peplum dress, I thought I'd give myself a break by making the Sorbetto top. I've already downloaded the pattern, and found 2 bits of scrap viscose that are the current contenders for the top - almost ready to go! I think both would make lovely tops! I have already purchased pink and bronze coloured bias tape... very excited! Once I've chosen the fabric for the Sorbetto top, I am planning on using the other one for New Look 6965. Another simple top, another perfect pattern for using up scrap! Not to get even more ahead of myself or anything... but I can already see a summer where I can wear lots of comfy homemade tops and dresses! Having read so many great reviews for this pattern, I can't wait to have a go at it myself! I have some lightweight cotton poplin that I'm planning on using (we all know what that looks like, so I'm not going to bore you with a picture here). Ah oh... I just thought of one more! 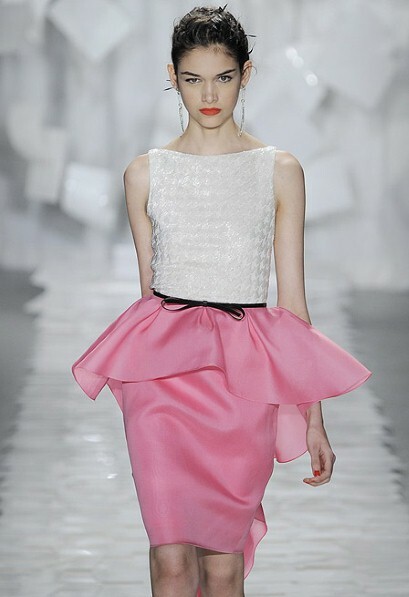 It's off the runway, by Jason Wu... need I say more? Another quick one from me - it's been a while since my last wedding dress progress update... so you must be wondering if I had given up on it already?! Not only because I spent 2.5 days on my shiny new green dress? and a couple of days feeling over the moon with it? Of course not! I've kept going with it and now I'm pleased to report a couple of milestones! Milestone 1. April 2012 marks the end of hand sewing of all the seams on ALL layers (yep all 7 of them!) of my wedding dress - so I have now hand overcast all the exposed seams, pressed seams flat where appropriate and catch stitched seam allowances to the fabric/underlining. I haven't got a photo to hand but will be sure to share the world of hand sewing with you when I get a chance! Milestone 2. I'm ready for the lace-up back! I finally know how to do this! I tried it on one side of the mock corselette, with 2 different types of cords. One is from Liberty, the first 7 slightly thinner loops on the left of the picture, and the other a viscose/nylon thicker cord. I preferred the Liberty one (apparently I have expensive taste :o) so will probably go for that for the wedding dress. Just in case that the loops still aren't strong enough, I also secured them to a strip of silk organza selvage to help maintain shape too. Now I can sleep tight! 1) The loops on both sides still stick out too much when pulled so I'm going to made the loops even less deep. 2) I'm going to insert/move spiral steel boning next to the closure on both sides, in order to have a smoother finish and less wrinkles. Other than that, with my chosen fabric (the silk dupion), the strong but skinny cord from Liberty, and V shape that I'm finally happy with, I am ready to move forward! The end is (almost) in sight - get ready to celebrate! After lots of trial and error (as usual), I think I've figured out the way to make the loops for the lace-up back of my wedding dress. So in my previous toiles, I have used various shop bought ribbons and cords but have found that 1) they looked alright but not quite perfect, and 2) I always worried about the strength and the cords fraying from the ends so that a lot of force (oh the price we pay to look slim for the big day!) may pull it apart. Think that for a wedding disaster! So of course I kept trying. Then I found it! It's the best of both worlds - using cords covered by the fashion fabric, in my case, the silk dupion used for my dress. This way the colour will of course match, the cord should fray less as it's encased, and the loops will be really strong! As I spent ages trying this (and of course looking at the PR discussions and other useful sources), I thought I would share a tutorial in case it does make someone's life easier one day! Fold the bias strip lengthwise in half, with right sides together. So the bias tape is placed from one end of the cord, leaving a small tail (end #1), and finishes around the centre of the cord (end #2). We will need to start sewing from end #2 first. Using a piping foot/presser foot, start from end #2 (centre of the cord) and sew through the fabric and the cord and across until you are just over 1/8 away from the cord. A close up to show the wider gap at the end #2 of the strip. I used a really wide bias strip to try this in fact so your version should have the stitches must closer to the edges. I hand sewed the first few stitches across to secure the cord. All this (the securing stitches and the wider gap) is to facilitate the turning out later on. OK I went a bit overboard with this step so my practice loops had some seams that popped open... but consider this a lesson learned! At least I will make sure that this won't happen for the real wedding dress! As you can see, I did trim very close to the stitching line here. This was because I had made 2 attempts prior to this without being able to turn the fabric out! I would suggest trimming as closely as you can, bearing in mind the fabric you are using for the bias strip. In my case the dupion frays without anyone touching it (honestly!) so no wonder the stitches turned out not to be secure enough. So from end #2, with the extra gap, you should be able to turn the bias strip out to the right side! If you've left yourself sufficient gap, you should be able to do this fairly easily! Good luck! I didn't use any special tools for this and it only took seconds... so trust me it does work! There you have it! covered cord ready to be made into the loops for the lace-up back! You could also make this as button loops if your dress has a covered button back. Now I am going to post the progress on my revised mock-up lace-up back in a separate post. The detail that I absolutely LOVED about the Gossip Girl dress is the bow. Oh it's so oversized and dramatic, and most importantly two-toned! I loved how it spiced up what would've been a single coloured (not as fun!) dress. So when I tried to make a knock-off version, naturally I had to include the bow too. I made a rather large bow and cut 2 pieces (in 2 colours) of 30cm x 16.5cm, including seam allowances of 1.5cm all all sides. I also cut a smaller piece later on for the tie which was sewn in the middle. It was roughly 10cm x 6cm. With RST, sew the 2 pieces together at one of the long (30cm) side. You should end up with a square when you open the joined piece. Press seam allowances open. If you are using a soft fabric and want a structured look, you may need to consider interfacing/underlining. Here I'm using taffeta so it's stiff enough. Turn the "bag" over to the right side at the open side, and fold over the seam allowances at the open side to the inside. With the longest running stitch on your machine, stitch 2 rows next to the centre leaving the start and end open, i.e. do not back stitch. Pull the threads at both ends to gather up the middle. Baste over the stitched lines to secure the shape. Fold the 3rd (small) piece of fabric lengthwise with RST and sew 2 sides leaving one edge open. Turn the right side out and close the open edge with a topstitch or a couple of stitches of hand sewing. I machine finished this as I was feeling later - it's possible to hide it at the back of the bow. Wrap this around the bow until you've achieved the look you want (I folded my centre piece slightly) and pin it at the back. Tack the hoop into the bow at the back and we're done! I hope this help. I used two tones of green for my project and really liked it but think there are so many different looks that can be achieved with this. I could imagine a floral version of this, with a bright centre hoop for a summer dress or even as a hair accessory. Who knows? I may use the same method to make a bow for the back of my wedding dress! Perhaps I could have a blue loop to be my something blue! 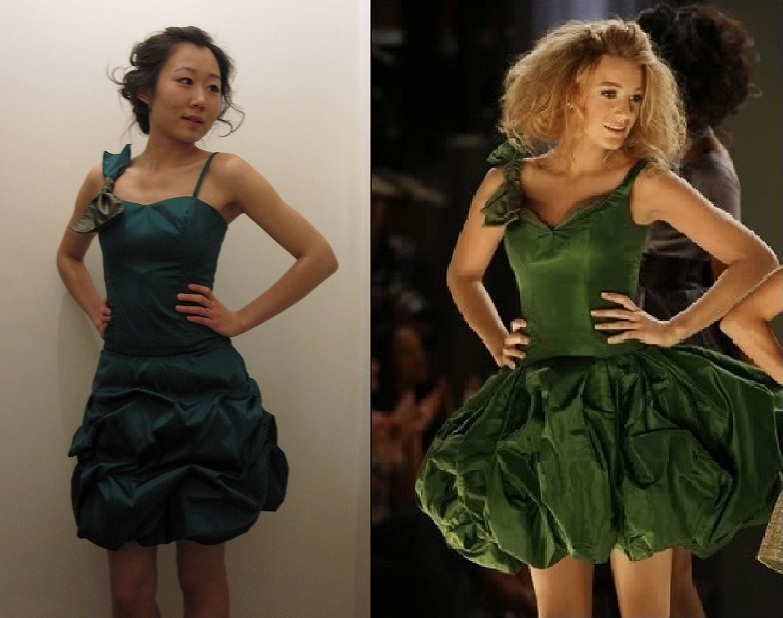 After 2.5 days of solid sewing and a lot of trial and error, I am finally happy with my entry for the RTW contest, as inspired by the Gossip Girl green dress (in reality I think this was a dress designed by Lorick New York). Before posing for the PR contest and uploading my entry, I thought I'd share a couple of techniques that I have tried out when making this dress, in case anyone would find it helpful. I cut the skirt layer as a half circle, made of 3 pieces: skirt front and 2 skirt back pieces. If you need help in drafting a half circle skirt, there are lots of tutorials out there if you google it (and that's the reason why I didn't think it was necessary to repeat it here). I cut the skirt layer about 70cm long. If you want a fuller skirt with more drama, or equally a slimmer look, then you will need to adjust the skirt pieces accordingly, eg cut a circle skirt or a more A-line skirt. Also if do not want to have the pick-up skirt detail, then the skirt pieces can be much shorter, they will only need to be slightly longer than the lining. Similarly, if you want less pick-ups, then you could shorten the skirt layer also. Then we need to cut the lining pieces. The key for the bubble hem is to use the lining layer to structure the look. You will need to cut the lining pieces narrower (but do bear in mind that you've gotta be able to walk in it...) and shorter. Using the same waste measurement as the skirt pieces, I cut the 3 lining pieces, with the length slightly shorter than what I want the finished skirt to be (as the bubble will make the skirt longer). The top left corner of this picture shows what I used as a skirt lining pattern (I used the same pattern to cut all 3 pieces -- the front piece on fold and the back pieces allowing for seam allowances). For the skirt, with right sides together ("RST"), sew skirt back pieces to front piece at side seams. Then sew back pieces together, leaving a gap at the top of the skirt back for inserting a zip later. I left 12cm but this will depend on person. Similarly follow the same steps to assemble the skirt lining. Now you should have both layers done, except for the partially open centre back seams. On the wrong side of the skirt, using the longest stitch on the machine, and with very strong thread (this is crucial if you want to avoid the disappointment of a broken thread when you're almost done with the gathering...I've been there! although the colour of the thread will not matter as it will not show on the finished project), sew 2 lines of running stitches next to one another, at about 0.5cm and 1cm respectively to the bottom of the skirt. DO NOT back stitch at the start or the end. Pull the threads at both ends to gather bottom of the skirt to the length of the bottom of the skirt lining layer. With RST, sew the gathered skirt bottom to the bottom of the skirt lining, with 1.5cm seam allowances (so that the gathering stitches won't show through). This step is optional - I used a layer of gathered dress net to make the skirt more poofy and fun but only one layer so it's not too crazy and that I still can find an occasion to wear the dress. I recycled some of the dress net from my wedding dress toile #1 (which I have now cut into pieces to be reused!) and cut it to be slightly narrow than the length of the skirt lining, and 5 metres long. I left a gap at the centre back again so the zipper won't get all jammed with the dress net. Then I gathered it at the top until it matches the top of the skirt lining and attached it to the wrong side of the lining. With the wrong sides of the skirt and lining together (with or without the dress net), I sewed the top of the layers together, leaving the zipper space open still. The above is a photo of the layers just before I sewed the top together. Now the pick up skirt. This is more to do with trial and error, until you are happy with the result. As the name suggests, you would need to pick up a bit of the skirt layer, and pin it to the lining layer. If you are using dress net, I would pin it through both the net and the lining. I think the pick-up skirt is really versatile - you could make it as random as you like, or as structured as you like. Different fabrics will also give this a different look. I wanted mine to be quite relaxed and loose, and thought my attempt in the above picture was a little too tight. so I tried again and again! Once you're happy with how it looks (do make sure you actually are 100% happy... as I had to unpick a couple of times! ), hand sew the pick-ups in place with tailor's tacks. Note that for the back, I worked around the zipper (as it's quite short anyway) so I didn't have any pick-ups at the centre until the bottom of the zipper ended. If you want pick-ups all the way to the top of the skirt, I would suggest using an elastic waistband instead.